And I cheep, cheep, cheep. Where I sleep, sleep, sleep. Eggmund, a Scentsy Buddy, has hatched! Just in time for Easter! This super cuddly chick Scentsy buddy is perfect for the Easter Basket. Eggmund’s egg bottom is removable. As with all Scentsy Buddies, you insert your choice of scent paks in the zippered compartment to add a special scent for your little buddy. 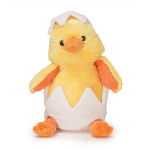 Eggmund is a limited edition Scentsy Buddy and will only be here while supplies last.